A short blog post by Vancouver web developer and photographer Kris Krug caught my eye back in February. He accused a fellow Flickr user [name deleted] of claiming credit for photos Krug had taken. End of story, I thought, but a cease and desist letter last week from a lawyer demanding that Krug delete the blog post set off a blogstorm that will last a lifetime. See Krug's post, [Name deleted] Stole My Photos and Now is Sueing ME!?! If [Name deleted] wants to pursue a career in the creative arts, journalism, or any other field that requires a reputation, he'll need to either change names, or turn this into a selling point for his future. The Google Juice involved in raising awareness of his apparent plagiarism is so powerful, this story will probably always be at the top, or near the top, of an Internet search for his name. He will always be "the photo plagiarist who tried to sue his victims." See Thomas Hawk, Diane Ensey, Chris Garrett and Jeff Nolan on the subject. Assuming he decides to try to resurrect his name (not a lot of evidence yet, except a couple of apologies), [Name deleted] will need to be very clear, vocal and consistent with his apology, and throw himself on the mercy of the blogosphere that has allowed him to so publicly tarnish his name. The assault on this guy's reputation was massive. Bloggers were very deliberate about including his name in the headline of their posts, to ensure they would show up in a search for the name. People on Flickr and on Digg related their efforts (including addresses and phone numbers) to contact him, his freelance clients, his web hosting company and others, to spread the news about his transgression.. Pretty harsh, maybe, but right in line with the summary career assassination that would have taken place if he was a journalist. I've never met him, but I hate Sanford Wallace. In the mid '90s, I had just talked my spouse into an e-mail account and was helping her figure out how it could help her writing career. I laugh when I compare that one intrusion with the dozens of spam messages one of my public-facing e-mail accounts gets hit with daily. Today I shrug them off without pausing. But that first spam attack by Wallace felt like the time our house got broken into. It felt personal, and abusive. Our ISP was no help. I don't remember what finally worked in getting rid of that daily message from the spam king. Now Wallace has been hit with a $4 million penalty for his spyware intrusions. All I can say is, the penalty is a decade late, and the penalty isn't nearly high enough. After years of receiving dubious e-mails from various government figures, relatives of royalty, and lawyers with lofty connections in Nigeria, I've received a legitimate business offer from a very nice woman in the Netherlands. It seems Maryann Jacob recently discovered a metal box with $15 million in U.S. currency, and wants my help in stealing it from a customer of the security company that she works for. Normally I wouldn't want to get involved in something like this, but it appears Maryann hasn't been happy in her job, and wants to pursue life as a public figure. Sounds like a legitimate reason to me. Maryann has asked me to keep this confidential, until we can get our hands on the money. I'm asking you, my blog readers, to keep this under your hats. Once I have succeeded in this "risk-free" endavour and have my 40% share, I'll make an announcement about where the party is going to be. It promises to be quite a blow-out! If you receive a similar e-mail from Ms. Jacob, please delete it, or report it to the authorities. I'm already providing assistance freeing up the money, so there is no need for you to pursue the matter. Besides, it's quite possible that you might be motivated by greed to help out this disgruntled employee. My motives are much purer. For similar "offers", see the Crimes of Persuasion site. Boing Boing Tracking Down Canadian "Lawyer"
Cory Doctorow is hot on the trail of someone using a Rogers e-mail address, who is purporting to be a Canadian lawyer. The writer's inability to spell "lawyer", "Queen's Counsel" and "libel" was the first tip-off that "Don Deveny" might not be a real lawyer. After checking with various provincial law societies, Doctorow found no such lawyer registered, and is turning up the heat with research into the person who owns the e-mail account that was used. I'm dying to see how this story ends. Lesson: You're not as anonymous as you think you are. Trivia: Queen's Counsel is a designation granted by a law society, denoting that someone is a senior lawyer with an excellent reputation. It doesn't come with any extra powers, and has been superseded in some provinces. Colin McKay - Is Traditional Public Opinion Polling Dying a Slow Death? Business Week and others reveal payments for editorial mentions of a lobbyist's clients in op-ed pieces placed by think-tank analysts. David Weinberger marvels that he still can't perform some basic image placement functions in Word, despite 20 years of refinement of the standard word processing program. (With some help from his blog readers, he figured out how to solve the particular problem he was complaining about, but what happened to the good old days when WordPerfect let you view its commands and delete the ones that were causing problems?). A long-time Word user complains about the dumbing-down of certain capabilities. The co-author of a new book on blogging takes the CEO of the world's largest PR firm to task for never linking to others in his influential blog. A much-discussed item in the PR blog world this week. Legislation for Canada's do-not-call list was passed in November, but it will take almost two years for the telemarketing regulations to be put into effect. "Last-minute changes to the Telecommunications Act, passed just before the federal election was called, will let Canadians add their phone numbers to a national do-not-call list. Telemarketers are prohibited from calling numbers on the list, and face a hefty fine if they do otherwise. "Too bad it will take nearly two years for the law to take effect." "Once the list is operational, Canadians who do not wish to receive calls from telemarketers will be able to add their telephone number to a single centralized list that telemarketers will be required to download regularly and respect. Both the United States and the United Kingdom have similar systems. "Penalties of up to $1,500 per offending call for individuals and up to $15,000 per offending call for corporations would be imposed for telemarketers who fail to respect the list. Funding to operate the list will be obtained on a cost-recovery basis from telemarketers themselves."
. . .(The) reality is that the bill has devolved into an embarrassing shell of its original self, rendered practically useless under the onslaught of lobby groups determined to thwart any attempt to limit their ability to call consumers at all hours of the day. The exemptions include registered charities, political parties, newspapers, survey organizations and companies that people have an existing business relationship with, says Canwest. You could see this one coming a mile off. I'm not surprised. An objective of good security is to protect users from attackers who want to prevent the user from controlling her computer. DRM -- like that in iTunes -- is a system for allowing remote parties (e.g. entertainment companies) to enforce their policy on your computer. Once you design the system to let anyone apart from the owner to control it, you open up the possibility that someone other than the owner will end up controlling it. On Slashdot, the skeptical readers will wait until they see more proof that the "flaw" poses an actual threat. A recent decision by the Supreme Court of Canada confirms that Lego has no patent protection here as it fights to keep market share. Having had its patent expire, Lego was trying to argue that the shape of the blocks' connecting knobs are distinct and should be treated as a kind of trademark. But Lego has already been acting like a company that has to outdazzle its competitors, and has been emphasizing tie-ins with Star Wars, Spiderman and other movies in recent years, in an attempt to differentiate itself from Canadian competitor Mega Bloks. 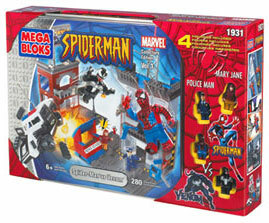 The Montreal-based Mega Bloks is meeting the marketing challenge with tie-ins of its own (including Spiderman). The company says it "has a presence in 14 countries and sales in over a hundred." "With regard to patents, the court cites with approval language from several years ago that states "patent protection rests on a concept of a bargain between the inventor and the public. In return for disclosure of the invention to the public, the inventor acquires for a limited time the exclusive right to exploit it. "On the trademark side, the court also notes the limitations to trademark, stating that "trade-marks law is not intended to prevent the competitive use of utilitarian features of products…In Canada, as in several other countries or regions of the world, this doctrine is a well-settled part of the law of trade-marks. In the law of intellectual property, it prevents abuses of monopoly positions in respect of products and processes." For those who speak Lawyer, here is the actual ruling. See a Fast Company 2001 article on how Lego has struggled to find its niche, despite having owned the niche for decades (via Boing Boing).